The Flip and Find Weighted Desktop Reference Organizer from Aidata is a modular, expandable reference organizer with a sturdy slip-proof weighted base. This reference organizer unit includes 10 double-sided 8.5" x 11" document display panels and 10 index tabs and is able to tilt back at a 25° angle to assist in optimizing viewing. The display panels are double sided anti-glare transparent sheaths with a semi-rigid edge to protect reference materials from spills, dust and oils/grime which will otherwise often accumulate on frequently handled papers. The extra weight and rigidity afforded by the panels makes it easier to Flip through the materials and Find the desired information efficiently. The Weighted Desktop Reference Organizer can be expanded to provide 20 or 30 total viewing panels by purchasing the optional expansion kit accessory. Some simple assembly is required. The Flip & Find Flex Arm Desk Clamp Reference Organizer from Aidata is a versatile, adjustable, and expandable reference organizer which clamps to any surface up to 6 cm (2.36") in thickness. The adjustable arm floats the conveniently angled reference organizer above the desk for easy access and storage. 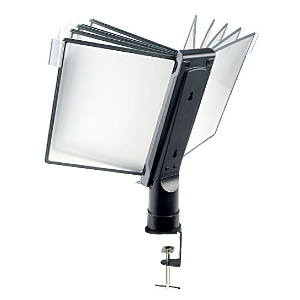 The adjustable arm offers a significant range of movement, rotating 360°, providing vertical range up to 16" above the mounting location and horizontal extension up to 24". This provides quick and easy access to reference materials, as it can adjust to the optimal height and position for a wide range of users. 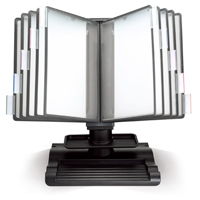 Included with the unit are 10 double-sided 8.5" x 11" document display panels and 10 index tabs. The display panels are double sided anti-glare transparent sheaths with a semi-rigid edge to protect reference materials from spills, dust and oils/grime which will otherwise often accumulate on frequently handled papers. The extra weight and rigidity afforded by the panels makes it easier to Flip through the materials and Find the desired information efficiently. Expansion modules can be purchased to add an additional 10 or 20 viewing panels, bringing the total page capacity up to 60 pages. 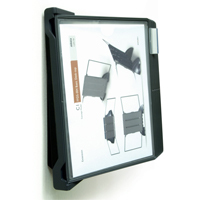 The Flip & Find Wall Mounted Expandable Reference Organizer from Aidata is a simple, easily expandable, wall mounted solution to provide quick access to commonly accessed documents. It is often used for reference in showrooms, stockrooms and warehouses but can also be deployed anywhere that specific information needs to be quickly referenced on a regular basis. 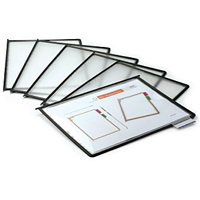 Included with the unit are 10 double-sided 8.5" x 11" document display panels and 10 index tabs. The display panels are double sided anti-glare transparent sheaths with a semi-rigid edge to protect reference materials from spills, dust and oils/grime which will otherwise often accumulate on frequently handled papers. The extra weight and rigidity afforded by the panels makes it easier to Flip through the materials and Find the desired information efficiently. This unit comes with hardware necessary for wall mounting but can also be easily detached and used as a portable reference if necessary. Capacity as a wall mounted unit can be easily expanded by combining multiple units using the included joining plates. The Wall Mounted Expandable Reference Organizer unit can also be added to the FDS005L to increase the capacity of the Flip and Find Weighted Desktop Reference Organizer. The Flip & Find Rotary Display Reference Organizer from Aidata is capable of holding up to 30 document display panels, providing users with fingertip access to 60 single sided documents. The display panels are double sided anti-glare transparent sheaths with a semi-rigid edge to protect reference materials from spills, dust and oils/grime which will otherwise often accumulate on frequently handled papers. The extra weight and rigidity afforded by the panels makes it easier to Flip through the materials and Find the desired information efficiently. The rotary carousel design provides full 360° quick and easy access to reference materials and the heavy weighted base ensures stability. A convenient fold-away carry handle lets the unit be easily repositioned as necessary. The Flip & Find Rotary Display Reference Organizer comes with 30 double sided panels compatible with 8.5" x 11" documents and 30 index tabs. This is the ideal solution for displaying large quantities of reference material which needs to be quickly and frequently accessed. Some simple assembly is required. These replacement document panels will fit all of the Letter Size Flip & Find reference organizer models. Each document pocket has anti-glare polypropylene covers with a one-piece injection-molded frame and permits display of two full 8.5" x 11" pages of material. The document panels come in a pack of ten with a charcoal coloured frame. The Flip & Find Desk Clamp Reference Organizer is a document display system which conveniently clamps to any location along the edge of a desk or counter (up to 2.36" in thickness). Included with the unit are 10 double-sided letter size (8.5" x 11") document display panels (capable of displaying up to 20 documents) and 10 index tabs. The display panels are anti-glare transparent sheaths with a semi-rigid edge to protect reference materials from spills, dust and oils/grime which will otherwise often accumulate on frequently handled papers. The extra weight and rigidity afforded by the panels makes it easier to Flip through the materials and Find the desired information efficiently. For improved readability the document panels are angled at 25° from vertical and the unit freely pivots a full 360° on the base for ease of access from any direction. Some simple assembly is required. The Flip & Find 2-Motion Rotary Reference Organizer from Aidata is an innovative document display and quick reference system capable of displaying reference material in either portrait or landscape orientation. The reference organizer includes 10 double-sided 8.5" x 11" document display panels and 10 index tabs. The display panels are double sided anti-glare transparent sheaths with a semi-rigid edge to protect reference materials from spills, dust and oils/grime which will otherwise often accumulate on frequently handled papers. The extra weight and rigidity afforded by the panels makes it easier to Flip through the materials and Find the desired information efficiently. The reference organizer is equipped with a sturdy anti-slip weighted base which permits tilting documents from a 0° to 90° angle to improve visibility as required. 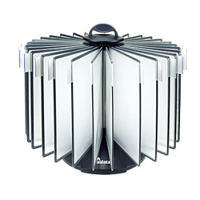 It is also able to rotate a full 360°, making it ideal for viewing from both sides of a counter. Some simple assembly is required. The Flip & Find Executive Information Reference Organizer from Aidata is a convenient desktop display and quick reference system capable of displaying up to 20 pages of information. 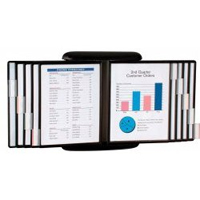 The reference organizer includes 10 double-sided 8.5" x 11" document display panels and 10 index tabs mount. The display panels are double sided anti-glare transparent sheaths with a semi-rigid edge to protect reference materials from spills, dust and oils/grime which will otherwise often accumulate on frequently handled papers. The extra weight and rigidity afforded by the panels makes it easier to flip through the materials and find the desired information efficiently. To facilitate easy reading and leave desk space clear documents are raised 6" above the desk surface and angled at 16.5° from vertical, a shallower angle than some other Flip & Find models due to the greater elevation of the documents. 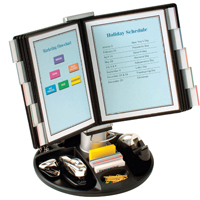 The Executive Information Reference Organizer features a large anti-slip grooved base that features two levels of storage for writing utensils or a convenient place to lean a smartphone. Cable guides are built into the rear of the base to ensure that charging cables remain accessible. The Flip & Find E-Z Wall Display Reference Organizer offers wall-mounted access for up to 20 letter-sized (8.5" x 11") pages of indexed reference data. 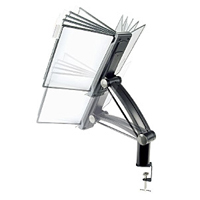 The included 10 display panels are double sided anti-glare transparent sheaths with a semi-rigid edge to protect reference materials from spills, dust and oils/grime which will otherwise often accumulate on frequently handled papers. The extra weight and rigidity afforded by the panels makes it easier to Flip through the materials and Find the desired information efficiently. Index tabs are included to further improve the speed of access. The Flip & Find E-Z Wall Display Reference Organizer comes with hardware for mounting to most standard walls as well as a rare-earth magnet mounting option for securing to metal walls or equipment. Some simple assembly is required. The Executive Rotary Base Flip and Find Display Carousel allows users to keep frequently referenced documents perfectly organized, off the desk surface, and rapidly retrievable at all times. 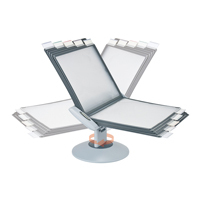 The carousel holds ten, double-sided, anti-glare document display panels (included) to organize and display up to twenty US-Letter sized (8.5" by 11") documents. 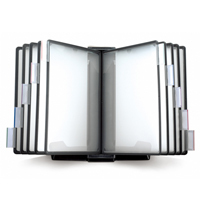 The display panels have sturdy, durable edges to allow easy page turning and to keep papers flat and readable. Index tabs are included. The heavy metal base on the Executive Rotary Base Flip and Find Display Carousel provides stability, and can be rotated a full 360º to allow users to share the displayed information with others. The base includes several molded compartments to organize stationery and other office supplies.